Deacon Alexandros Petrides, joined the St. Nicholas Community in Bethlehem on June 1, 2013. The oldest of six siblings, and the son of a local Greek Orthodox Priest, the Deacon grew up in Stroudsburg, PA, and remembers visiting St. Nicholas as a youth to participate in its many ministries. After graduating from Penn State University with a Bachelor of Science in Civil Engineering and a Minor in Engineering Leadership Development, Deacon Alexandros followed his call to serve Christ, and shifted his focus from water resources to "living water," placing his trust in Christ's words that "Whoever believes in me, as the Scripture has said, 'Out of his heart will flow rivers of living water.'" (John 7:38) He and Diakonissa Stephanie were married in 2010, and have one son, Niko. On January 21, 2013 he was ordained to the Holy Diaconate by His Eminence Metropolitan Savas of Pittsburg, on the feast day of St. Maximos. 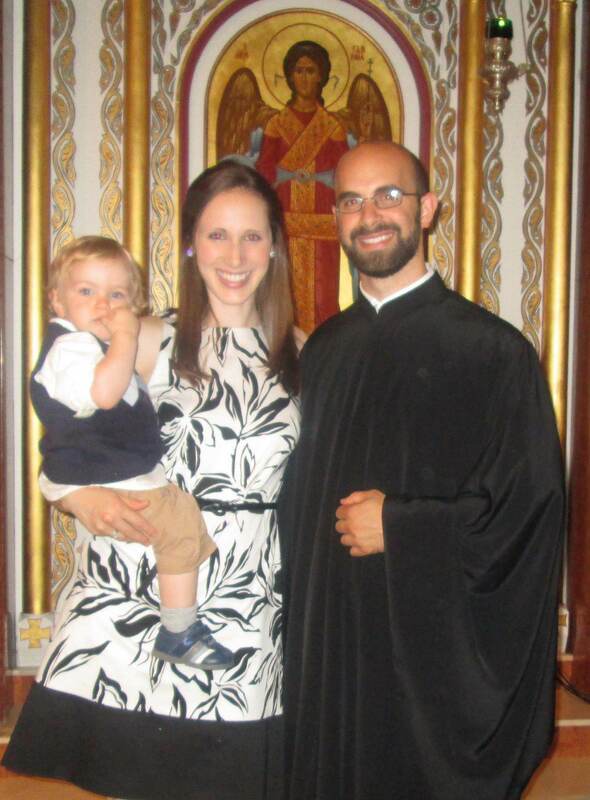 After graduating from our beloved seminary, Holy Cross Greek Orthodox School of Theology in Brookline, MA, from the Masters of Divinity Program, Deacon Alexandros and His family received their assignment to join Fr. Nicholas Palis in serving St. Nicholas Cathedral. Deacon Alexandros has a passion for youth and young adult ministry, having himself been involved in the fun and formative experiences of Camp Nazareth, JOY, GOYA and the Penn State OCF. While at Penn State he served on the National Student Advisory Board for OCF where he met and formed friendships with other young adults, many of whom are now faithful lay and ordained leaders of the Church. This is one of the many reasons Deacon Alexandros feels so strongly about pan-Orthodox youth and young adult ministries, such as OCF, which cultivate relationships, understanding of other Orthodox traditions and leadership for the future of Orthodoxy in America. In addition to these activities, the Deacon enjoys traveling abroad - especially on pilgrimage to Mt. Athos - spending time outdoors with his family, mountain biking, snowboarding and playing any pick-up sport he is invited to!